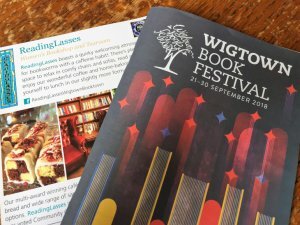 Some celebrate the arrival of Autumn with a harvest festival, but for Wigtown in Dumfries and Galloway, it is with a book festival. Embarrassingly, this was the first time in 12 years we have visited the festival, but we are already planning on staying over night in our VW Camper next year, so we can take in more of the authors, events and activities. Wigtown Book Festival has its 20th anniversary this year, and this has been celebrated spectacularly by the art of Astrid Jaekel. She has decorated some of the building’s facades by turning them into giant canvases, depicting old stories and myths surrounding the town. There are a plethora of authors to choose from, and if you want to see the better-known names, it would be wise to book early. However, even though we were late in booking up we still found a lot to interest us. Although avid readers (one of us anyway!) we had never been to a book festival, so didn’t really know what to expect. The talks we saw took place in the beautiful Wigtown County Hall and took the form of an interview with the author. Both authors we saw were extremely interesting and the interviewers very professional. Afterwards, there was of course the opportunity to buy the books and get them signed, some people had even arrived with piles of books for their favourite writer to sign. We spent a pleasant few hours in between talks, ambling around the many of bookshops. But if you want a break from literature there are also several vintage and craft workshops. There is also The Kist, a craft and produce market, which appears regularly in Wigtown throughout the year, in a big marquee outside the County Hall. So, having spent nearly all our money on books, cheeses and tablet (a Scottish fudge), it was time for lunch – in a book shop, of course. Wigtown isn’t known as Dumfries and Galloway’s Book Town for nothing! We sat in a corner of cosy ReadingLasses Café and had homemade soup with sandwiches. Mary Turner Thomson – The Bigamist. It was Mary’s ex “husband” who was the bigamist, she hastened to make clear! Mary told us the very compelling true story of her ex, a psychopathic bigamist and compulsive liar. A charming man who, it turns out, has at least 13 children by 6 different women, and who claimed to work for the CIA. The story is extraordinary to say the least and would be unbelievable if it was a work of fiction. 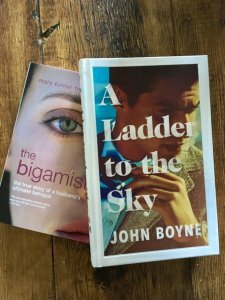 John Boyne – A Ladder to the Sky. John Boyne is probably most famous for his children’s book “The Boy in the Striped Pyjamas”, a very popular novel with our kids when they were growing up. But we were surprised to discover that he also writes fiction for adults. “A Ladder to the Sky” is a novel about a writer’s career and how he claws his way up “the ladder”. To continue a theme, Maurice also seems to have psychopathic tendencies, but his motivation is purely success as writer. 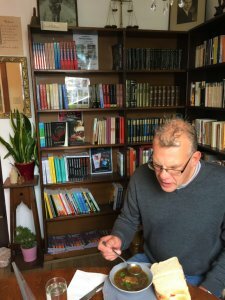 It was interesting to learn from John, about the process of writing a novel and hear some behind the scenes insight. The festival, which is held on the last week of September, is now over for this year, but why not visit the festival next year in one of our classic cars, or like us, in our VW Camper!